Learn how to use the UC Learning Center to sign up for and take training activities for UC San Diego faculty and staff and affiliates. 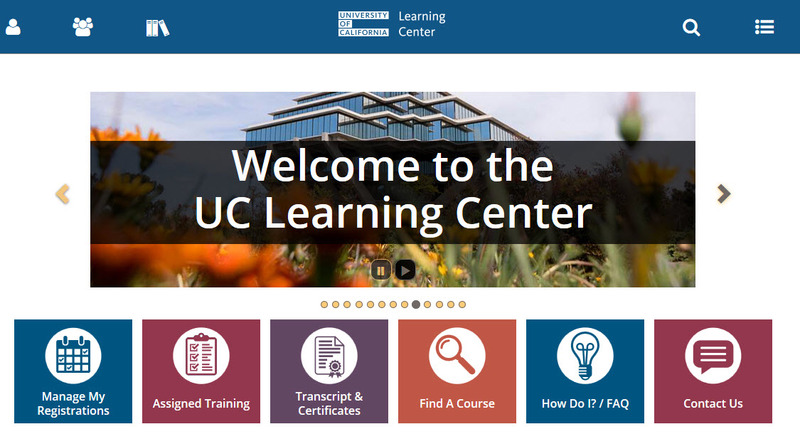 When you first login to the UC Learning Center, you will see the homepage. 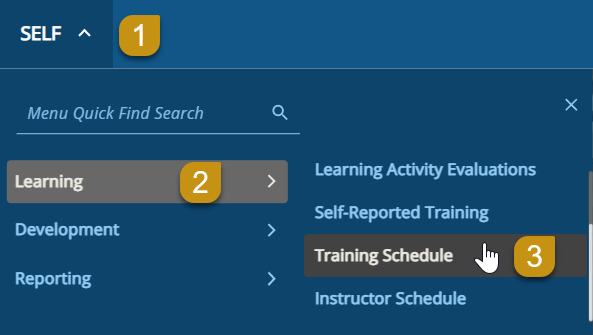 Here you can launch activities for which you are currently registered, navigate to your training schedule or transcript, and use search features to locate activities you wish to take. You can also get information about your direct reports. Manage My Registrations: View your Training Schedule, where you can see both upcoming in-person activities you have registered to attend, as well as any online activities you are currently in progress with. Assigned Training: View required and recommended training. Transcript & Certificates: View transcripts for any courses you have completed in the UC Learning Center, as well as any training you have self-reported. Find A Course: Search for a course. Contact Us: How to reach your location's LMS contact. The Top Menu will appear on every page. Hover over each icon to see where they will take you. Clicking the UC Learning Center icon will take you back to the home from wherever you are in the UC Learning Center. Click on the Search icon (magnifying glass) on the Top Menu. Type in the title or a keyword for the training you are looking for and press Enter. If you see the activity you are looking for, click the title to navigate straight to the description and registration and/or start options. 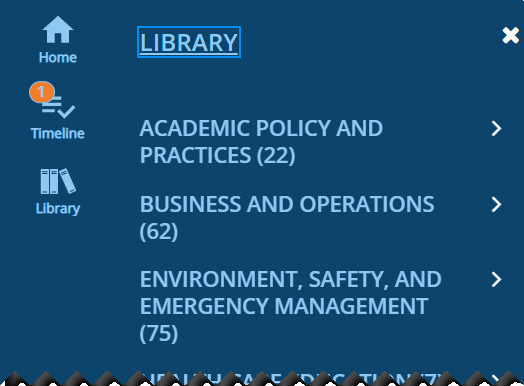 You can use the Library to view available learning activities in a specific topic. Click the arrow to the right of the category to view any subcategories. Click on the various categories and subcategories to review the learning activities available on that subject. Once you have located an activity, you can view more information about an activity such as the description, cost, etc. Use the Library or Search options to locate an activity. Click the title of the course you wish to see more information about. A new window will open with an activity summary. When you are finished viewing the course summary, click Close (or the X on the left of the screen) to go back to activity listings. Instructor-Led Training (ILT) or in person training requires registration. Locate the activity you wish to register in by using the Library or Search options for the course using the title or a keyword. Click Register to proceed to the next step where you'll see the available offering dates. The search results page displays only classes with available seats by default. Select All from the Seat Availability drop-down menu to see both classes with available seats and those with a waitlist. Select the offering of the activity you wish to attend. A blue box should appear next to the course title that says "Registration Allowed" if you are able to register for that course. Index numbers for Departmental Recharge can be input during registration and will be billed after the activity has taken place. Checks should be made payable to "UC Regents" and sent to Mail Code 0922, they must be received prior to the activity taking place. Follow the steps found in the "Registering for Activities" section of this guide to locate and begin the registration process for an activity. After you click Submit on the "Offerings" page, you will be directed to the "Payment Information" page. Choose your payment method from the Pay By drop-down menu. If Index Number is selected, a pop-up window will appear after you click Pay Now (be sure pop-up blockers are turned off). Enter in a valid 7-digit Index Number. Click Submit to finalize the registration. If Check is selected, click Pay Now to finalize your registration. Check must be received by Staff Education & Development prior to the start of the activity. Click on the arrow next to Options. In the drop-down menu, click Cancel Registration. This will take you to a confirmation page. On the confirmation page, click Cancel Marked. Your registration for this course is now canceled. You can also click the checkbox next to the course name and click Cancel Registration for a faster way to cancel. Locate the online activity you wish to take. When you find the activity you wish to take, click on the course title to view more details and then click Start. You can also click on the arrow next to Select and click Start to launch the course. An additional window will open. Do not close any windows. You will be shown the activity details if this is your first time in the course. Click Next to continue on to the course content. Note: Pop-up blockers will affect your ability to launch online courses. Disable your pop-up blockers (PDF) for the best experience. Some online courses require registration. For these courses, click Register to enroll and then you will see the Start button on the next screen. If you have already started an online activity that you were unable to finish, you can pick up where you left off. Click on the Timeline button on the Top Bar. This will show activities you are assigned to take and any activities you are currently in progress with. Locate the activity you wish to resume and click Start. When the activity launches you may be asked if you wish to resume where you left off. Click Yes. To view both upcoming in-person activities you have registered to attend as well as any online activities you are currently in-progress with, you can go to your schedule. On the Menu, click on Self, Learning, and then Training Schedule. You will see your training schedule with all of your current registrations. Assigned activities are activities you are required to complete by a specific due date, and some may require retraining on a routine basis. You will receive email notification of new assignments as well as notifications when it is time to retake a training. Review all required and recommended training, as well as your current status for those assignments. Take note of the due date to ensure that you complete your required courses on time. Your training transcript will include all activities you have completed in the UC Learning Center, as well as any training you have self-reported. You can also download individual training certificates. Because the UC Learning Center is a system wide tool, training history will follow you even if you change UC locations. You can export your transcript to PDF, to print or send electronically. On the Menu, click on Self, Reporting, and then Training Transcript. Review your full training transcript, sort your training by date or select to filter training by a range of dates or year. Note the default range only shows the last year of history. On the top right corner, click Export to PDF. Another window will appear. Click File. Your transcript will download in another window or tab depending on your browser settings. Click OK to close the window. Open your Training Transcript (see above). Click on the course name for the course you wish to view your certificate. On the top right corner, click on the arrow next to Start. In the drop-down menu click Diploma. Your diploma will appear in a pop-up window. Click Export to PDF. Another window will appear. Click File. Your certificate will download in another window or tab depending on your browser settings. Click OK to close the window. 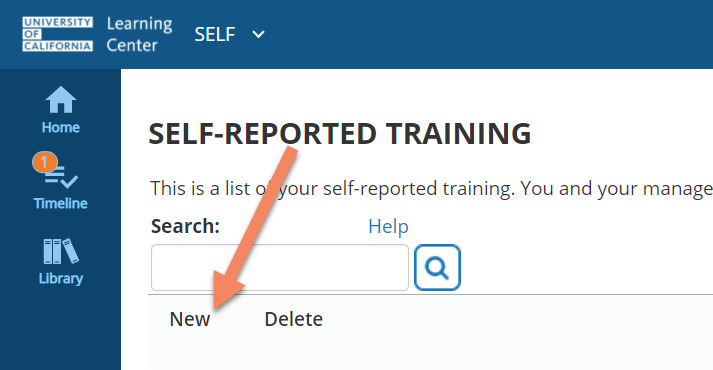 You can add records of training you took outside the UC Learning Center by using the Self-Reported training tool. On the Menu, click on Self, Learning, and then Self-Reported Training. 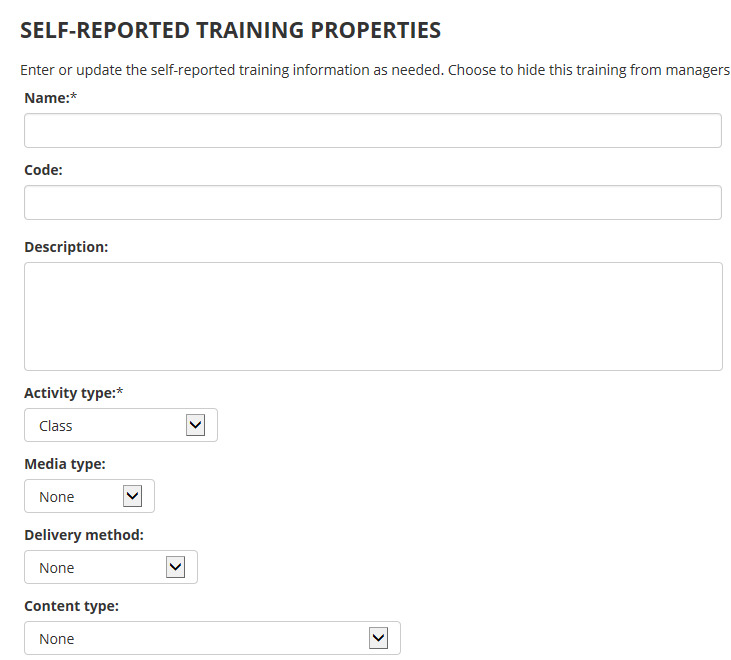 You will be taken to the self-reported training page. Here you will see any past self-reported training you have added. To add new training click New. A unique Activity code of your choosing (this is optional and can be the code used by another vendor if applicable). The Description of the activity as it was advertised. An Activity type. Please select Self-Reported Training. Select a Media Type if this was taken as an elearning/ virtual training, training video, reading of a document or manual, or some form of audio/broadcast. If this was in-person you do not need to select a media type. Delivery Method is where you may select the type of training this was, classroom, elearning, video, on-the-job (OJT), etc. Content Type offers categories of training this training may fall under, such as: Environmental Health & Safety, Health Care Education, Technology, Occupation Specific, etc. Cost if the training had a fee (numeric characters only). Currency, as well. The Start Date and time as well as the End Date and time, which are very important to include. The Score if one was given. You can select the Duration (the days, hours, minutes, or seconds the training took place). If Credit Hours were given you may include them. You can list the Activity Organizer, the name of an individual or organization that coordinated the activity. If you know the Name of the presenter you can include it. 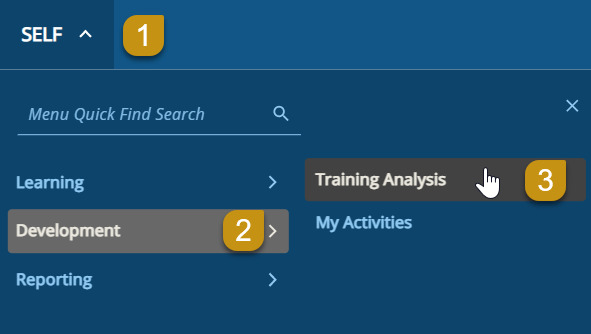 You can select to hide the training from managers or to not show the training on your transcript.